Receive up to BM$21 by attending this module. BM$ can be used to offset future course fee payments. Level 4 elevates the drummer to a higher level of expression. 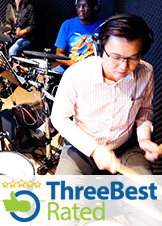 Creatively engage in the art of improvisation as you develop drum fills that speak your individual style. This module will challenge you to grow in playing independence as you further your unique personality as a musician. This instalment of THE STORY OF MANKIND will ignite and revive your quest for personal growth as you celebrate the spirit of invention. * Includes courseware and fully-equipped training studio. To be released at a later date. Special shout out to my Drum coach, who has been such a brilliant teacher. I highly recommend his class for those who want to learn from a very cool drummer, yet also patient and conscientious in his teaching, able to keep your interest and relate what you learn to contemporary songs. While learning different styles and beats, he will provide suggestions to songs with the same beat, which helps to spark my interest in practicing and learning. This is helpful for those scenarios where you don't really fancy the song you're playing, but you are given alternate song options for your varied interest. Also special thanks to the Customer Service staff for always providing 100% the best customer service (this is something I'm not skilled in hence I applaud greatly). To some this could just be part of the job, but your friendliness, sincerity and eagerness to help answer my queries and find trial classes for me has helped to create such a positive experience for me at Believer Music. Thank you! I look forward to my next term at Believer Music! Dear Believer Music staff, It has been a blast taking part in the Primer Contemporary Drum class. Thank you so much for a wonderful experience! :) I cannot give you guys enough thanks that I got to be part of this program. Where do I begin? I've always had an interest in learning how to play piano and drums. I first had a dream to play drums when I was 17. However the dream got shelved together with a pair of pink drum sticks and remained dormant for years. One fine day in 2018 I received an email in my company mailbox from Believer Music about drum and piano lessons. And Believer Music Tampines is just 2 streets down from my office. This is probably the first "sign" from God to reignite the lost dream.. I signed up for the drum trial and it was so so awesome to be able to play the drums. I was so pumped!!! Hence I decided to pursue the Primer Drum program. However as a new mother, the only time I could afford to devote to learning was my lunch hour. I was also informed that a class will only start when minimum of 3pax has signed up. So I signed up by faith and prayed that God will somehow allow the class to start, or provide 2 more people to join the same class with me at this specific timing. In the end God provided me 1 classmate and they started the class! I was so thankful! Thank You God and Believer Music! Throughout the duration of my course, I learnt much more than mere drumming. I rediscovered my passion for music and regained enthusiasm in learning how to play an instrument. I have never felt more alive while learning to play the drums. I now have a much greater appreciation of music in general. When I listen to music, I now hear the intricacies of the musical production and how each tune, beat and melody plays its own part in the song. It is so beautiful how it all comes together. I have a newfound and elevated respect for professional/accomplished/skilled musicians, especially drummers. In the past I just thought drummers were cool and part of every band. Now when I watch drummers in church and on YouTube videos, I realise how skilled and deft they are at handling each aspect and component of the drum kit to create the sound they want. They play a crucial role in anchoring the band and keeping each song in time, which is so important. Drummers may not get as much limelight or attention compared to vocalists perhaps, but they are such a vital part of the band. I learnt to trust God to provide as I prayed daily for the chance to attend this course. I learnt to persevere and practice hard at drumming even in times when I doubted myself. I learnt that dreams don't have to die, they can come back to life if you work at it and have faith. I learnt that the basics are important in helping me to master the more complex parts of drumming. Who should sign up for this module? Am I eligible for signup? *Should you have prior playing experience, use the Online Course Allocator to identify the module most suitable for you. NOTE: Should Believer Music Coaches find any student mismatched in any particular module, we reserve the right to transfer the student to another class after the first session to optimize the learning experience. How different is Level IV compared to Previous Levels? Level IV focuses on gaining more independence in playing with Fills improvisation. In this module, you will be learning some useful Fills patterns and incorporate it in playing today's popular songs. How will these 3 months benefit me as a drummer?